Home 26 weeks pregnant bump date first baby pregnancy second trimester 26 Weeks Pregnant - Pregnancy Bump Date - 1st Baby! 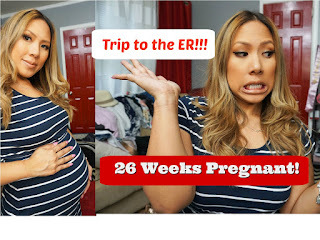 26 Weeks Pregnant - Pregnancy Bump Date - 1st Baby! My 26th week of pregnancy was a doozy! I took a scary trip to the Emergency Room and was laid up all week. Take a listen to my dramatic story, some lessons learned, and also hear my plans for an upcoming baby moon! Baby girl is the size of an eggplant or butternut squash and weighs in at 2 lbs. Trip to the ER - I took a trip to the ER last Monday - possible diagnosis of bronchitis, and cracked ribs/rib strain. Ouch! They couldn't give me an x-ray or anti-inflammatories but I did have an ultrasound to make sure it wasn't anything like a blood clot or deflated lungs. I was concerned for baby especially because of my high pain level - any time I moved or breathed it was like stabbing pains to my ribs and I was suffering from shortness of breath. I ended up just giving myself bed rest and mucinex and prescribed cough medicine and basically had to sleep upright since then as laying down hurts more and cuts off my breathing.. But I skipped the antibiotic and vicodin that was prescribed for me since I wanted to see if I could heal on my own first. I'm doing better now but still taking it easy, no working out, lots of rest. Maternity photoshoot - I purchased a bunch of dresses online for our upcoming maternity photoshoot during our baby moon. Video coming soon! Help me pick out my dress and check out hubby's hilarious reaction as he rates my outfits. Stomach is getting heavier - I feel like I'm carrying very low. I've been trying to stand straight to improve my posture but I definitely feel the strain on my lower stomach and back. The pregnancy support belt I've mentioned helps a lot. Stay tuned for my Maternity Dress Try On this weekend! ELF Smokey Eye Review and Giveaway! 25 Weeks Pregnancy Bump Date - First Baby!